The Republican Party draws a deep breath of relief, narrowly holding a House of Representatives seat in a Georgia special election. 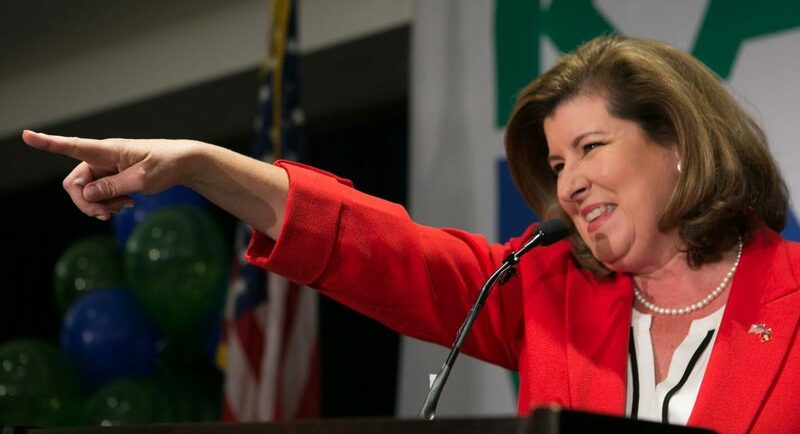 Karen Handel, a former Georgia Secretary of State, took 51.9% of the vote versus Jon Ossoff’s 48.1%, a victory of about 10,000 ballots in Georgia’s 6th District near Atlanta. Handel’s margin in the seat, held for almost 40 years by the GOP, was sharply down from the 23% for Tom Price — now Health Secretary — in November, although it surpassed Trump’s narrow lead of 1% over Hillary Clinton. Despite the surge in their support, Democrats had hoped to “flip the 6th”. Ossoff had held a narrow lead in polling up until the eve of the election. The race was the most expensive House campaign in US history, with almost $55 million spent between the two sides. The GOP also held onto three other seats in Tuesday special elections, although the margin was also significantly reduced in South Carolina. However, while the GOP in Congress may get a bit of breathing space after failure to pass any major legislation since the January inauguration, Trump is likely to be under renewed pressure this week. Attention is likely to focus once more on the expanding Trump-Russia inquiry, with more revelations as Special Counsel Robert Mueller briefs legislators of both parties. CIA Director Mike Pompeo allowed National Security Advisor Michael Flynn to attend sensitive intelligence briefings of Donald Trump, despite concerns over Flynn’s links with Russian officials. In late January, senior officials across the US government, including Acting Attorney General Sally Yates, believed Flynn had become vulnerable to Russian blackmail over his business interests and his conversations with Russian Ambassador Sergei Kislyak in late December. Flynn misled the FBI when he was questioned about the discussions with Kislyak, which included consideration of the removal of US sanctions on Moscow. But almost every day for three weeks, until Flynn finally left his post, Pompeo briefed Trump with Flynn listening. Pompeo has not said whether CIA officials did not inform him of their views of Flynn. An administration official said Pompeo did not share any concerns about Flynn with Trump. Either Director Pompeo had no idea what people in the C.I.A. reportedly knew about Michael Flynn, or he knew about the Justice Department’s concerns and continued to discuss America’s secrets with a man vulnerable to blackmail. I believe Director Pompeo owes the public an explanation. Donald Trump is proposing large budget cuts to federal programs that shelter the poor and fight homelessness — except for the federal housing subsidy that is paid directly to private landlords like Donald Trump. Trump earned at least $5 million between January 2016 and April 2017 from a 4% stake in Starrett City, the nation’s largest subsidized housing complex. The federal government paid the partnership that owns Starrett City more than $490 million in rent subsidies since May 2013. Almost $38 million has been paid since Trump’s inauguration in January. Housing and Urban Development spokesman Jereon Brown insisted Tuesday that the administration’s decisions on housing programmes are not influenced by Trump’s interest in Starrett City. Diluting Donald Trump’s claim of a victory in keeping plants in the US, Ford is moving production of its Focus model to China after production at its Michigan plant ends in 2019. Ford estimates the move will save it $1 billion. Trump had praised the company for not moving the plan to Mexico. Commerce Secretary Wilbur Ross said in a statement that Ford’s plan for production in Chongqing “shows how flexible multinational companies are in terms of geography”, while adding that the administration expects the flexibility to go both ways. Ford attempted to ease news of the shift to China by announcing $900 million of investment in its Kentucky factory to build big SUVs. PreviousIran Daily: Was Tehran’s Missile Attack In Syria A Dud?